Precise monitoring and characterization of differences between batches and manufacturers during the process of drug development and production is vital to ensure consistency in efficiency and potency. Trastuzumab, a recombinant IgG1 monoclonal antibody for the treatment of Her2 positive breast cancer was used to demonstrate the proposed SCIEX workflows designed for such analyses. Samples of Trastuzumab from two different manufacturing sources were obtained for comparative analysis using peptide mapping. This analysis illustrates what is required for biosimilar characterization, or for analysis of processing and production alterations that may affect the final product. Presented here are the results of the investigation into the differences between the two batches. Also discussed is the ability of the proposed workflows and technologies to rapidly and simply characterize and quantify differences between batches. Two samples of biosimilar Trastuzumab therapeutic obtained from separate manufacturers were labelled, TRAST-1 and TRAST-2, arbitrarily and blindly for differentiation purposes. TCEP (tris(2-carboxyethyl)phosphine) and iodoacetamide were purchased from Sigma (St. Louis, MI, USA). ProteaseMAX™ and trypsin were purchased from Promega (Madison WI, USA). Samples were denatured using ProteaseMAX™, reduced with TCEP, alkylated with iodoacetamide and digested using trypsin per standard protocols. Batch comparisons of biologics are of vital importance for the manufacturing process. To this end, enabling rapid, simple and facile workflows to compare manufacturers or product batch lines is vital to ensure that quality and efficacy of product is maintained. 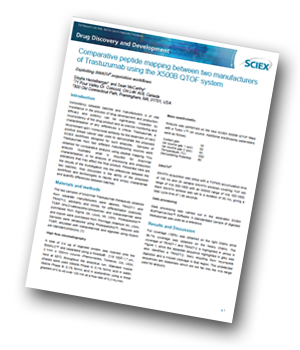 The benchtop X500B QTOF mass spectrometer was developed with this in mind, for routine analysis of biologics and fast batch comparison with the dedicated BioPharmaView software. In the comparison of two manufacturer batches of Trastuzumab, several significant differences were discovered, including an internal semi-tryptic fragmentation as well as changes in levels of a peptide and its deamidated form, which can both be determined using the dedicated BioPharmaView software. These detected changes are significant for process scientists tasked with determining batch-to-batch variability in a routine environment.